Ah Sperrmüll time again! This huge pile of junk piled up in front of my building today. 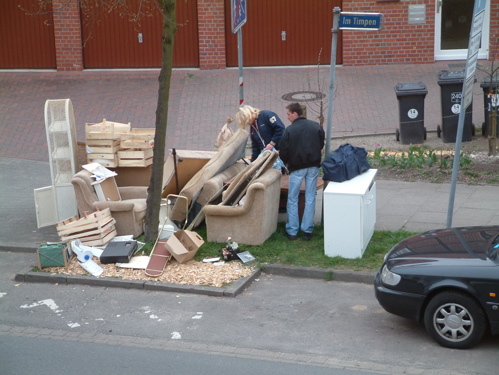 Basically Sperrmüll is just junk that you would normally take to the dump but once a month they pick it up for you. 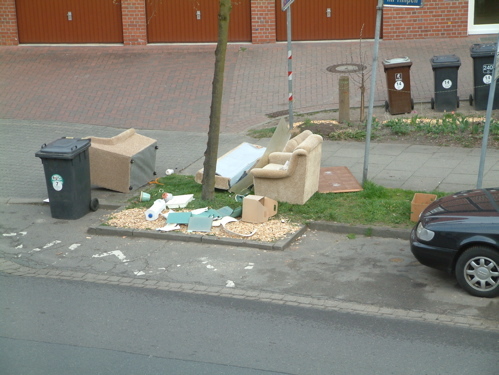 I think in some cities you may have to pay for it to get picked up, but, as far as I know, in Lüneburg it is free. There are always scavengers driving around and sorting through the junk to see if there is anything worth having. In the case above they are about to attempt to take this brown desk/table thingy somewhere. They will give up soon after and walk to the next pile. Still many drive around with small trailers attached to their cars or mopeds. If they find something interesting they throw it in back of the trailer and move to the next pile. I’ve heard many of the hunters come from Poland and make a nice profit repairing washing machines etc., then turning it around and selling them back home. I myself have recovered perfectly functioning RAM chips, 3.5 floppy drives and IDE cables as well as 2 great designer chairs from the 60’s, a few small tables, lens caps, a power adapter for my camera and someone’s diary. The last time I tried reading the diary my German wasn’t really good enough to understand much of it. Maybe I should try to find it and post some translations here.